“There are white caps in my coffee cup! !” Yep, while sitting in the cockpit about to take a drink of freshly perked hot coffee, a gust came up and nearly blew it all into my lap. Just another example of fun while waiting out the Northers! 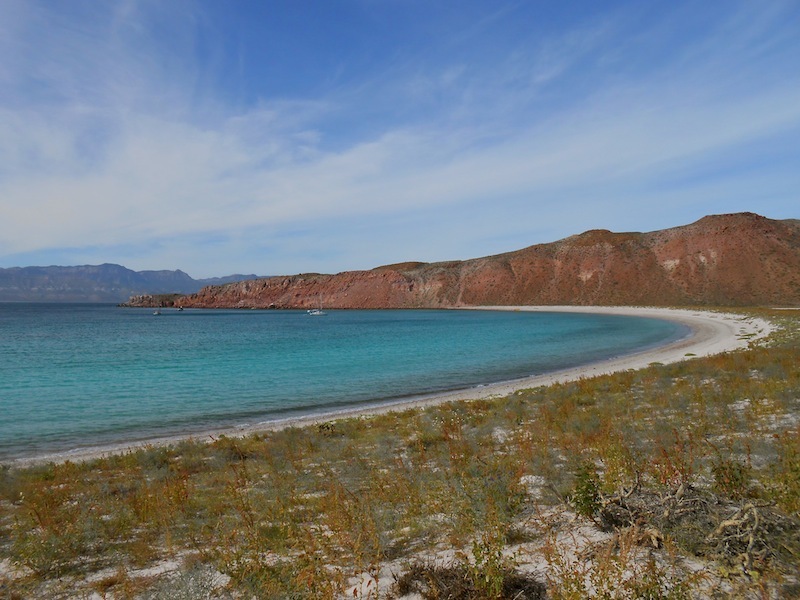 We are anchored in the southernmost bay of Isla San Francisco, which is about 30 miles north of La Paz. We sailed here two days ago down the San Jose Channel from our last anchorage in Bahia San Marty (although it shows as Marte on the charts! ), which is 50 miles north. Our trip down was a fun one, with plenty of wind behind us. We left the anchorage at dawn and enjoyed an incredible sunrise as we picked our way through the waves crashing over the rocks guarding the entrance. The winds were already blowing in the low teens, so we set a reefed main sail and full Genoa (that’s the big one on the front). It wasn’t too long before we took in the main and flew along with only the Genoa. 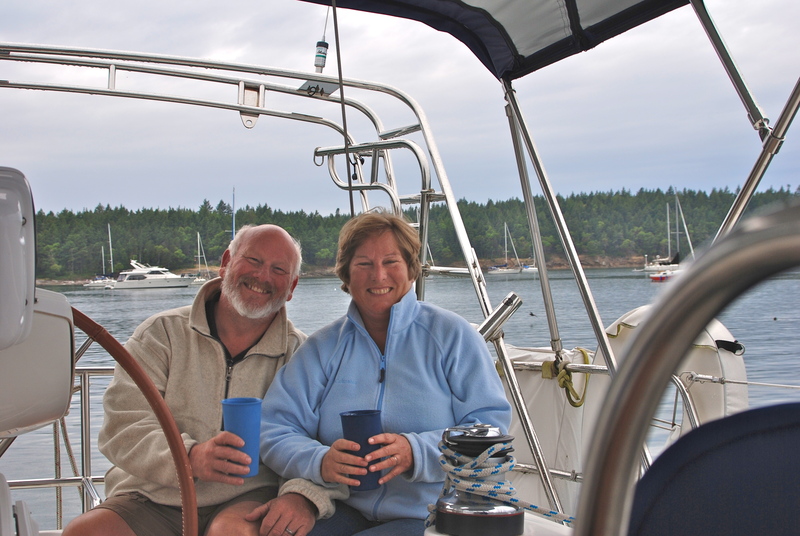 A few hours later we reefed the Genoa, then rolled it up completely and put out the storm jib (the smaller headsail). We started hitting high 8 knots with just the storm jib and things were getting a little squirrelly with the building seas, so we reefed the storm jib too! We had been decreasing sail all day because the wind kept building. By the time we were ready to make the turn into the bay it was blowing consistently in the high 20’s, gusting 30’s, and we were doing 6-7 knots with a tiny slip of sail. Thankfully we were in a following sea so it was a “smooth” ride..ha! We made the turn into the bay and set the anchor in 18 feet of crystal clear water. We’ve been getting tossed around a lot but the waves are small since we are tucked in fairly close to the beach with a rock cliff on the north side. The plan at the moment is to stay a few days even after the winds subside so we can explore this beauteous spot. 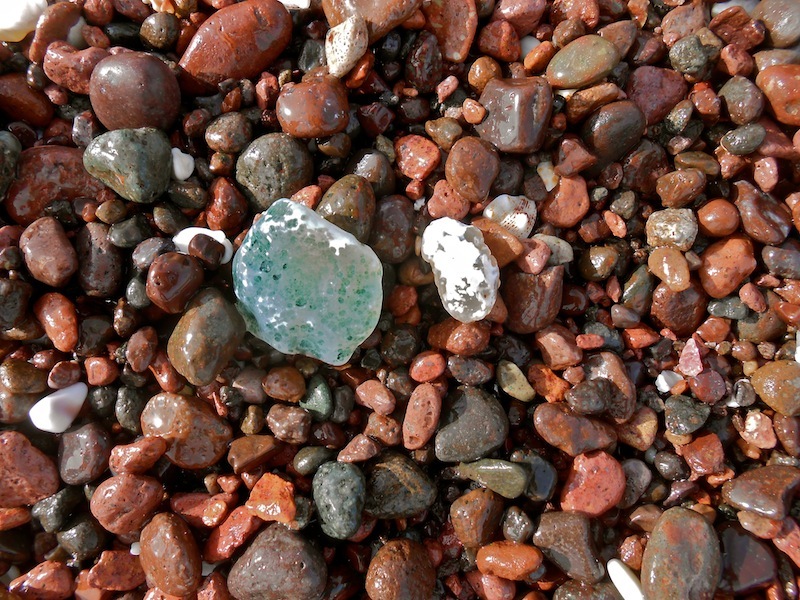 There are hikes to take, beaches to walk, agates to find, and fishes to swim with. Speaking of fishes, yesterday was a banner day on Happy Dance! We caught 4 fish without even putting out a line. A panga came by around 4pm with 5 guys aboard asking about tortillas! It took us a minute to figure out that they were asking us if we had any tortillas to give them. It seemed like a funny question for the Mexican guys to be asking the gringos, but after some stumbling conversation we found out that they’d gotten here on Monday (5 days before) and were running out of food. There is a fish camp just around the point where they come to fish from La Paz (remember that is 30 miles away across open water and they are in a 20′ open panga). They generally come up to fish for two days, staying overnight one night. With this storm they’ve been stranded on the Island and can’t go across the channel to San Evaristo or back home to La Paz because it’s too rough. We didn’t have any tortillas, or anything they were really interested in, until we mentioned t-shirts because they all looked so cold. After some funny discussion and hand signals, we settled on a t-shirt for each guy in the panga if they’d bring us some pescado blanco (white fish). I’m so tired of tuna! They upped the ante to 8 t-shirts; 1 for each of the other amigos back at their fish camp too. So off they went to get us some fish and we went below to raid Marty’s closet of the shirts he’s been waiting to give away! Pretty soon Guillermo and the boys were back, with the most beautiful fish I’ve ever seen! 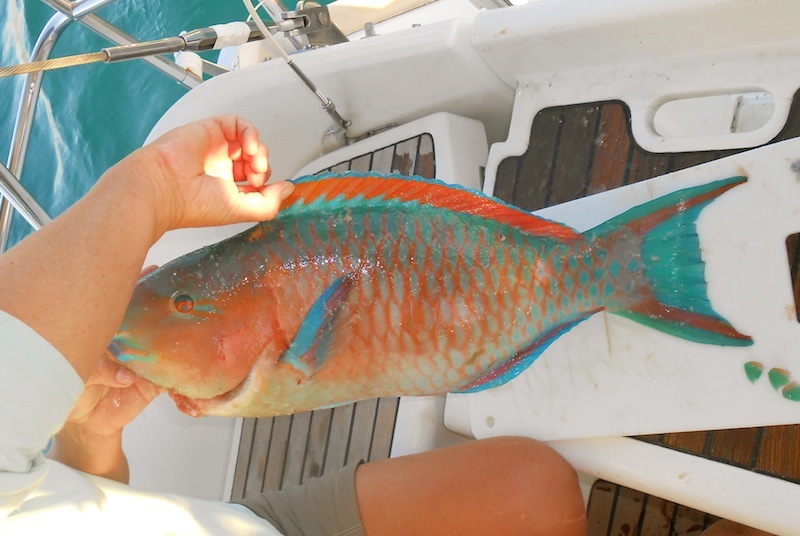 It was about 18″ long with gorgeous aqua blue, green and yellow colors (might be some kind of snapper?). The scales were like guitar picks, an inch wide with colored tips, and impossible to cut with a knife. They also brought us 2 trigger fish, which look like leftovers from the Mesozoic Age, with a sharp horn on their head and skin that is tough as leather. The 4th fish was about 15″ long and was maybe a grouper? They told us the Spanish name but I can’t remember. We also gave them some water and half a loaf of bread that I’d made, so all in all it was a good trade. I filleted all four fish and we had pan fried white fish last night that I’d dipped in an egg and covered in seasoned bread crumbs, along with some sweet potato fries….YUM! Does anyone know what kind of fish this is?? 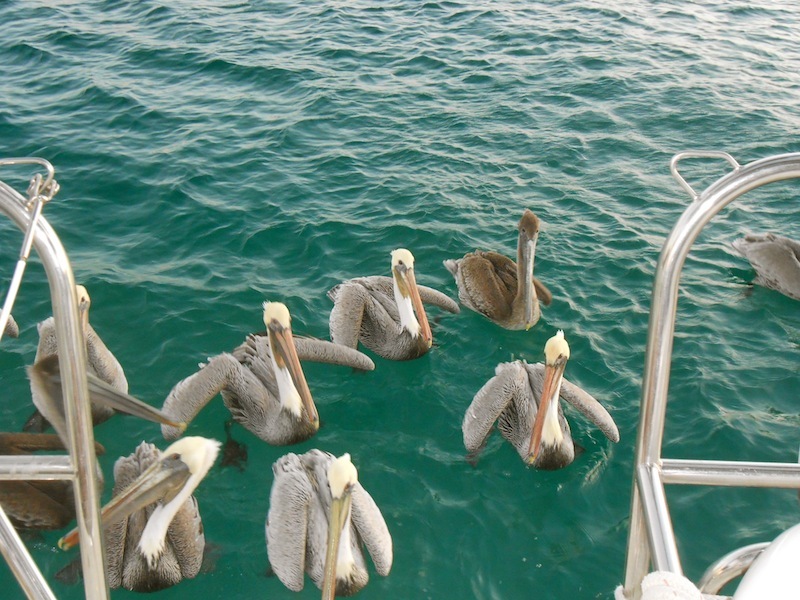 As I was filleting the fish the pelicans and sea gulls started gathering around to watch and wait for scraps. It reminded Marty of the kayakers in McCovey Cove in San Francisco, jockeying for position while waiting for a home run ball. When I’d raise up a piece of fish that I was about to toss over, they’d all sit up straight to watch my every move with wings in ready position, then they’d all pounce! One poor guy caught the triggerfish carcass and I’m not sure it went down too easy. We could see that his pouch was full for quite awhile; sure hope we didn’t hurt the poor thing! This morning Guillermo and one other amigo, Ramon, were back in the anchorage making the rounds. I had told them last night to bring back the water bottle and we’d refill it for them. Well, they brought a 5-gallon jug instead of the quart bottle we’d given them, but what the heck. We filled it up for them and told them about the latest weather forecast, which called for 20-knot winds all day. It’s amazing to me how these fishermen go out in some pretty gnarly seas without a way to get a weather report. I guess they can see what’s happening and know the patterns, but they still seem to get caught offguard by these Northers, which can blow pretty good. At the moment in the North end of the Sea about 100 miles away it’s blowing in the 30’s consistently and the seas just build and build since there isn’t anything to stop the fetch as it gets to us! But back to our amigos; once the jug was full they headed off and I said I was “cocinado pan” (baking bread) if they wanted to trade later in the day. The whole group just showed up, still in their wetsuits and fishing gear, and gave us two more yummy looking Snappers in exchange for a loaf of bread! They also had a bunch of Conch and something really ugly that had magical powers or something (you’ll have to ask Marty)! They are fun guys and it’s a highlight of our days to joke around with them. So here we sit, listening to the huge white capped waves breaking out in the channel, watching the boats swing on their anchor chains, and waiting, waiting, waiting for the winds to calm down a bit. All is well though; the scenery can’t be beat, the company is good, and we have plenty o’ pescado! 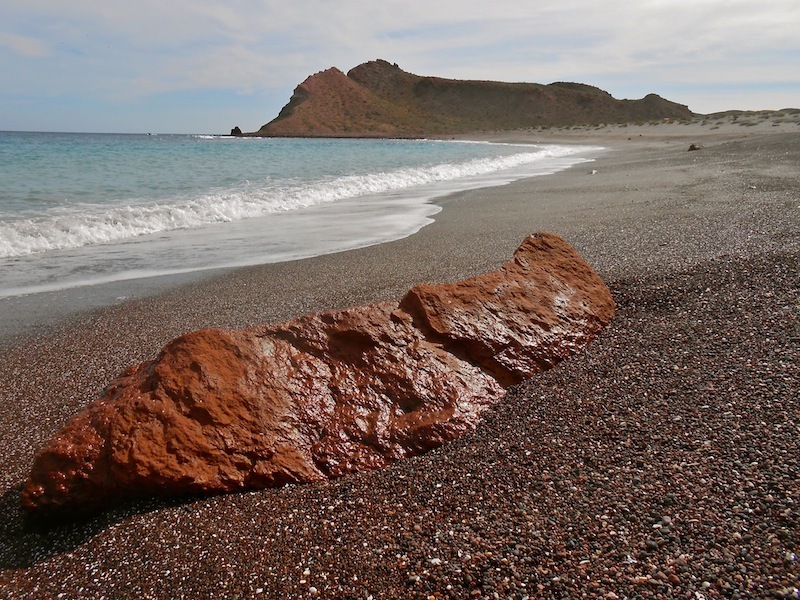 The other side of Isla San Francisco…agate heaven! ← Keeping the plans fluid!